Series 25 of the Eisele BASICLINE includes hollow screws and swivel screw fittings with a throttle function. They are designed as a cone-type throttle. In addition to the simple throttle there are also versions with a non-return valve, as well as inlet and outlet throttles. 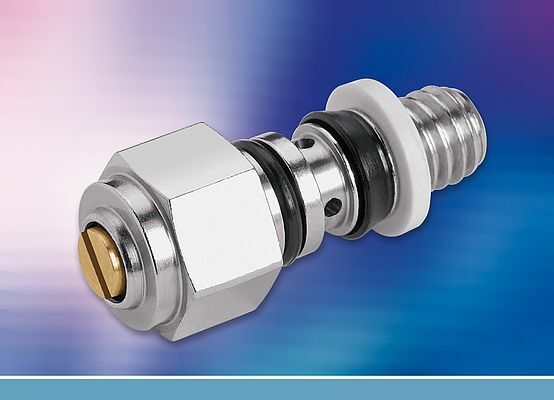 The functional threaded joints are available with an adjustment slot, counter nut or knurling and allow precision adjustment for exact regulation of compressed air and gases. For different installation situations the hollow screws are available in a short and long version, as well as a version for combination with high banjo fittings. The swivel screw fittings are normally combined with the Eisele series 10, 14, 14A, 15, 17 and 18. Durable VS seal rings ensure a tight seal of the built-in hollow screws in the installation. The functional threaded joints can be used for the precise control of pneumatic cylinders in many special applications. Their robust solid-metal construction guarantees a reliable and long-lasting installation even in harsh industrial environments. Thanks to the modular kit principle, all hollow screws are compatible with all Eisele connection components.